“Look, I know you’re not gonna like it but as I see it, there’s only one person to go after for this. 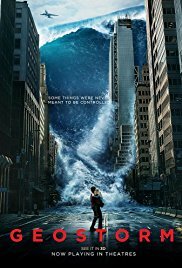 “Geostorm” adresses an issue which is highly topical currently. The influence we have as human beings on the climate. And the consequences this has on our environment. Is it really true we’ll be bathing in the shadow of the Cologne Cathedral in the future ? And will polar bears slowly exchange their winter fur for a thinner version, in such a way that after a few decades they look like oversized hairless Sphynxes ? Or will we be continually plagued by natural disasters that’ll cause a multitude of victims among the population? The same problems are presented in “Geostorm“. Fortunately, they had more visionary spirits and they joined forces worldwide. An immense network of satellites spans the earth and scientists can always intervene in a focused and coordinated way (from the ISS), in case of out-of-control weather conditions. Until some things start to go wrong. A disaster movie. Please no talking. Show some disasters. “Geostorm” is a typical disaster film. There are some advantages while viewing this type of film. You can leave your brains at home because they aren’t really necessary. If you have to pee urgently during the film, you don’t need to watch the rest of the film with squeezed buttocks. It’s like a daily soap on television. If you miss something, you can still follow afterwards. But be honest. When you’re going to watch a movie like “The day after tomorrow“, “Twister” or this one, you don’t expect deep and ingenious written dialogues. You want to see impressive images with masterly designed digital effects on the screen. Not? The more dramatic and devastating the disasters are, the more successful the film. The footage of disasters on our planet aren’t always impressive and baffling in “Geostorm“. But the images from space, look incredibly realistic and enormously intense. You thought the images from the ISS space station being pulverized in millions of pieces in “Gravity” were impressive? Well there are some sequences in “Geostorm” that look even better. A bunch of well-known actors … who cares … bring on the disasters ! The summoned actors aren’t the least either. Gerard Butler is not the best choice to play the part of the highly intellectual scientist Jake Lawson. I don’t think people see Butler as a person with an extraordinary I.Q. (although I’m not saying he’s as dumb as an ox). Physical efforts and situations where muscles are needed, fits better with him. And there’s plenty of that in this film. Jim Sturgess plays his brother Max. You can’t say their relationship is really friendly. But as expected, this improves as we approach the end of the film. If you want to see Sturgess shine as an actor, you better try “Upside down“. Abbie Cornish looked familiar to me and that was because I saw her shine next to Woody Harrelson in “Three billboards outside Ebbing, Missouri” a week ago. Finally there’s also Andy Garcia as the president of the USA. And Ed Harris as the secretary of state. Not that it really matters how legendary some actors are, because the overall story told here really is a disaster. “Geostorm” isn’t a brilliant film. Sure, the movie isn’t completely boring. But there will be a few things that’ll annoy you. If it’s not the cliché content or the lousy, uninspiring dialogues, then surely the used special effects will cause annoyment. Because they are sometimes aweful and outdated. Like for instance the scene where an area was flooded by water and all of a sudden the water retreats. It felt as if it was filmed in a bathtub and suddenly the stopper was removed. And the U.S. behaving as if it’s the big savior of the world again, was enormously irritating. Especially when you realize they are currently the biggest deniers when it comes to global warming and certain agreements and guidelines are simply boycotted (every proposed measure gets opposition from the American Petrol Industry). You can’t say it’s all politically correct. But you shouldn’t expect something like that either when watching a simplistic spectacle film which was made solely for entertainment.